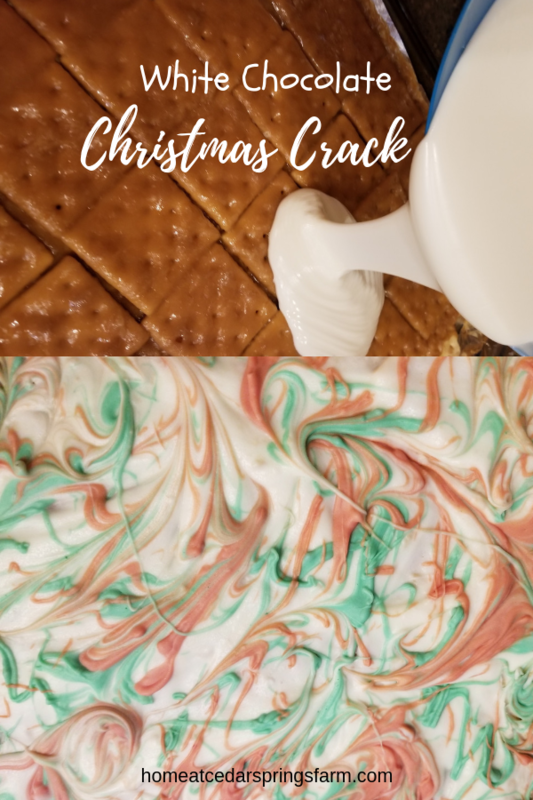 White Chocolate Christmas Crack is a saltine toffee candy made with butter, brown sugar, saltines, and white almond bark. It is crunchy, salty, sweet, and delicious! 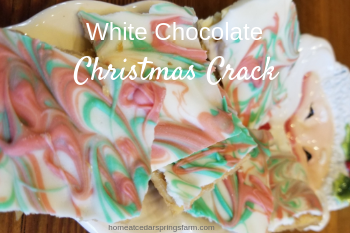 This White Chocolate Christmas Crack is a huge hit for the holidays. 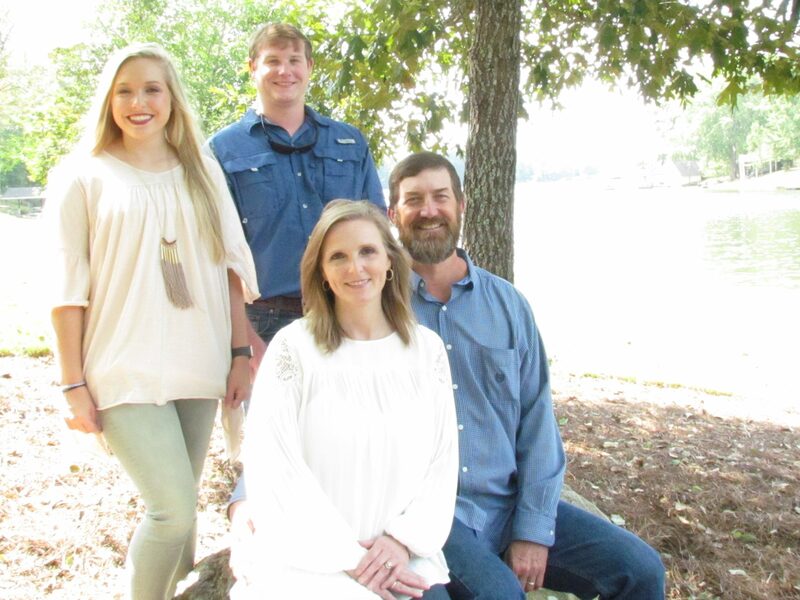 This would make a great gift for family, friends, and neighbors. Be prepared; they will all ask you for the recipe. The crackers get covered with a hot toffee, baked in the oven, and then covered with white chocolate! Sounds fantastic, right? This is so easy to make, and the red and green go perfectly with the holiday season. Feel free to add any of your favorite toppings. I made a batch for everyone to sample at the cookie swap and more for everyone to take home with them. I printed out the recipe ahead of time and placed it next to the plate full of the Christmas Candy. The recipe went home with all of the delicious sweets. 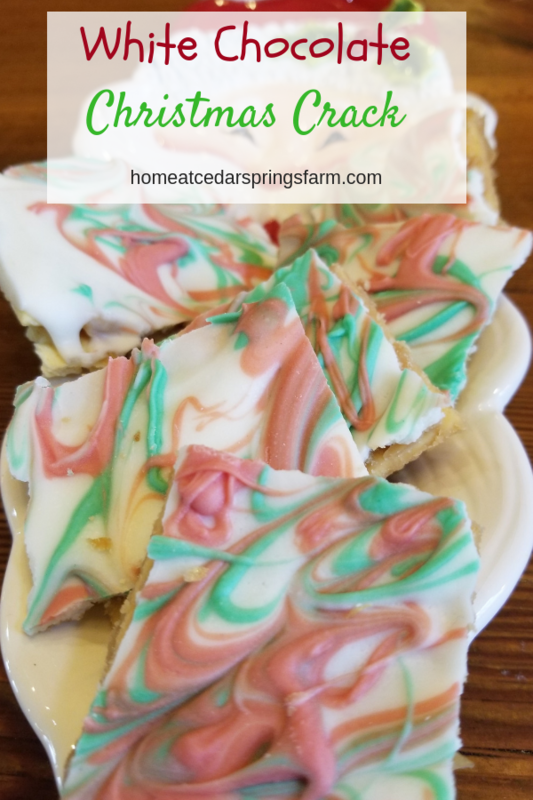 Make some White Chocolate Christmas Crack this holiday season for your loved ones. It is really easy, so worth it, and they will love you! Spread saltines over cookie sheet in a single layer. Melt butter and brown sugar over medium heat. Stir continuously for 5 minutes. Pour sugar mixture over crackers spreading evenly with a spatula. Melt almond bark according to package directions. Pour a small amount of the melted almond bark in two separate bowls. Add red food coloring to one bowl and mix well. Add green food coloring to the second bowl and mix well. Pour the rest of the melted almond bark over the saltine crackers and spread evenly. Drizzle and swirl the red and green food coloring over the top of the white almond bark. Top with your favorite candies; M&M’s, toffee bits, chocolate chips, etc. Place in the refrigerator to set up and cool faster. Break into chunks. Store in cookie tins, or zip-top bags. Keep in a cool area or in the refrigerator. Spread saltines over cookie sheet in a single layer. Set aside. Melt butter and brown sugar over medium heat. Bring to a boil and stir continuously for 5 minutes. Bake at 350 degrees for 8 minutes. While the crackers are in the oven, begin to melt the almond bark according to package directions. Pour a small amount of the melted almond bark in two separate containers. Add some red food coloring to one and green food coloring to the other. Stir until mixed and you have the color you desire. Top with your favorite candies; M&M's, toffee bits, chocolate chips, etc.